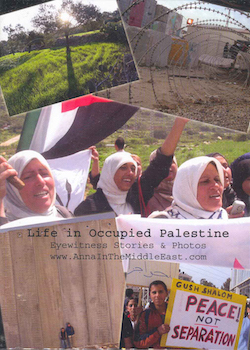 In Life in Occupied Palestine, Anna Baltzer, a graduate of Columbia University and the Jewish-American granddaughter of Holocaust refugees, documents her experience as a volunteer with the International Women's Peace Service in the West Bank. Baltzer provides a straightforward account of the Israeli-Palestinian conflict, while chronicling the almost unbearable living conditions of Palestinians under the Occupation. An accessible introduction to a difficult subject for American students. Anna Baltzer is a Jewish-American Columbia graduate, former-Fulbright scholar, the granddaughter of Holocaust refugees, and an award-winning lecturer, author, and activist for Palestinian human rights. As a volunteer with the International Women's Peace Service in the West Bank, Baltzer documented human rights abuses and supported Palestinian-led nonviolent resistance to the Occupation. Baltzer has appeared on television more than 100 times (including The Daily Show with Jon Stewart, where she appeared alongside Palestinian presidential candidate and nonviolence leader Dr. Mustafa Barghouti) and lectured at more than 500 universities, schools, churches, mosques, synagogues, and policy institutes around the world. Baltzer has contributed to various other books on the subject, including Shifting Sands: Jewish Women Confront the Israeli Occupation and Letters from Palestine: Palestinians Speak Out about Their Lives, Their Country, and the Power of NonViolence. She is co-founder of the St. Louis Palestine Solidarity Committee. In 2009, Baltzer received the Rachel Corrie Peace & Justice Award. She serves on the Middle East committee of the Women's International League for Peace & Freedom and the Board of Directors of The Research Journalism Initiative, Grassroots Jerusalem, and NewPolicy.org.